The Pimlico members club, 1955. The Preakness Stakes at Pimlico got its start at a dinner party one hot summer evening in 1868. Among the distinguished guests were Governor Oden Bowie of Maryland, a Milton H. Sanford of Civil War blanket fame, and one John Hunter who suggested that the wonderful meal be commemorated in the fall of 1870 with a race. It would be for three-year-old colts and fillies for two miles. He also suggested the purse be set at $15,000, a large amount back then! The name would be the rather unimaginative Dinner Party Stakes. Bowie wanted a new racecourse built in Maryland for the event and Pimlico was born with the Dinner Party Stakes held at its opening in 1870. Sanford’s horse named Preakness won the event but the race was later called the Dixie Handicap, now recognized as the 8th oldest stakes race in America. In the spring on 1873, a mile and a half race in honor of the Dinner Party Stakes winner was created. It was called, the Preakness! 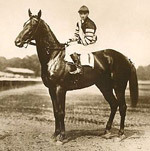 The mighty Man o’ War graced Pimlico with his presence and a win in the 1920 Preakness Stakes. There was a lot of excitement before the inaugural Preakness Stakes and 12,000 people came to the Pimlico track on May 27th in great anticipation. The track was pained violet, pennants in white and blue were flying proudly and a band was playing operatic airs and other famous tunes of the day. Everybody acknowledged Bowie’s efforts to put this locale on the thoroughbred racing map, and he had succeeded. Just seven horses lined up that day for the start but Survivor stayed true to his name, and galloped home to win by ten lengths along with $2,050 in prize money. The race continued for the next 17 years, and became more and more popular with each year. Sadly in 1889 there were changes in the racing industry and this race at this famous venue stopped suddenly. The next year the race was run at Morris Park in New York, and then for 15 years at the Gravesend track in New York. There were some trotting and steeplechases run at the Pimlico track which kept interest in racing alive, and finally in 1909 fans welcomed the Preakness back home to Pimlico. It was also around this time that racing results and news finally found their way onto the sports pages of newspapers, and not just on the social pages! These years away from the home venue have been called the “lost” Preaknesses. The hats at the Preakness are a close rival to those at the Kentucky Derby. 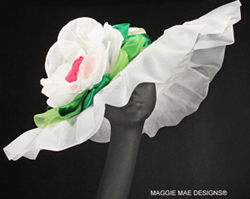 Hat creation and photo credit to: Sally Steinmann at MAGGIE MAE DESIGNS®. Here are some fun facts about the Preakness Stakes (May 16th 2015) and Pimlico Racecourse. The expression ‘wire’ for the finish line comes from a tradition in the 1800s where the winning jockey would untie a small bag on a wire stretched across the track at the judge’s stand. There were gold coins in the bag hence the expression for a racing prize as “a purse”. Maryland My Maryland is sung each year on race day, and this tradition began in 1909 when a bugler began to play the tune and everybody joined in. Also this was the year when the winning race colours were painted on the weathervane, a tradition that has stayed. Two ladies raced in the Preakness: Patricia Cooksey in 1985 on Tajawa who was 6th. Adrea Seefeldt came seventh in 1994 riding Looking. Five fillies have won the race: Flocarline in 1903, Whimsical in 1906, Rhine Maiden in 1915, Nellie Morse in 1924 and Rachel Alexandra in 2009. Eddie Arcaro has won six Preakness races. Whirlaway in 1941, Citation in 1948, Hill Prince in 1950, Bold in 1951, Nashua in 1955 and Bold Ruler in 1957. Pat Day came close to equalling him winning in 1985, 1990, 1994, 1995 and 1996. Calvin Borel came from the 13th position, the furthest outside position, to win in 2009. Smarty Jones beat the winning margin record set by Survivor at 10 lengths, winner of the first race. Smarty won by 11 ½ lengths. Pimlico is the second oldest track in the USA. 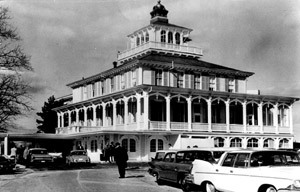 Saratoga opened its doors in 1864 in upstate New York. The land for Pimlico was purchased for just over $23,000 and the first track built for $25,000. The name Pimlico comes from the name given to the area by English settlers in Colonial times. It was originally spelled Pemblicoe in 1669. These settlers came from an area in London and they often spoke of happy memories from a favourite pub there called: Olde Ben Pimloco’s Tavern. The track was often called ‘Old Hilltop’ after a small rise or hill in the infield where trainers and race fans used to stand and watch. This was removed in 1938 as it, apparently, hindered viewing spots for media and movies. In1948, the Preakness was televised for the first time by CBS. These days about 60,000 people come out for fun, fashion, and races on Preakness day. Pimlico has survived fires, wars, depressions and even the anti-gambling movement in 1910. During this time a man called Billy Riggs created a system called ‘French Pools’ or pari-mutuel machines which were considered less sinful than the bookmakers with their blackboards. Pimlico also gets the credit for using the first electric starting gate in race history. The Woodlawn vase was first awarded in 1917. This original vase is brought out each year, under guard, from its permanent home at the Baltimore Museum of Art on race day. Today a half sized trophy is given to the winner. While the race is called The Run for the Black-Eyed Susans, none of these flowers are used as the race does not fall in their growing season. At one time, yellow Viking daisies were painted to look like Black Eyes-Susans. Today Viking Poms, part of the chrysanthemum family are used. Today, the race is limited to 14 horses, but in 1918 there were 26 entered so it was run in two divisions giving us two winners.